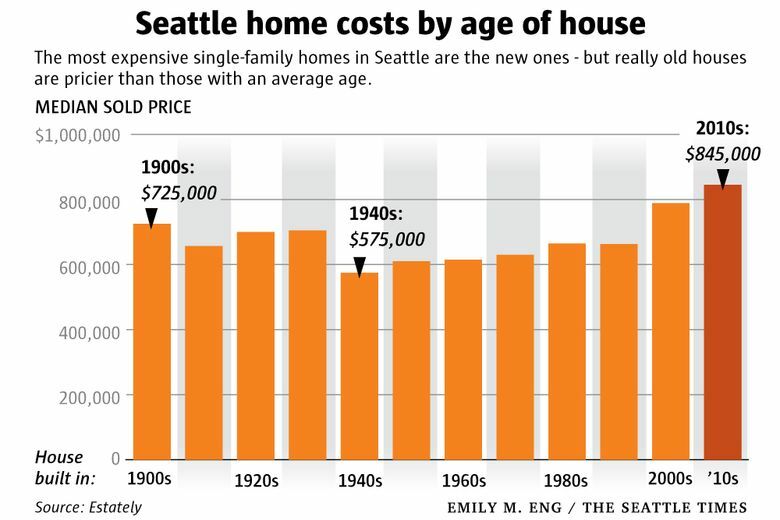 As home prices rise faster here than anywhere else, a new study shows that really old Seattle houses sell for more than middle-aged homes. The Seattle area has notched its sixth straight month as the hottest real-estate market in the country, as prices climb even faster heading into the peak buying season. The typical single-family house locally cost 12.2 percent more in February than a year ago, the biggest jump in three years, according to the monthly Case-Shiller housing-price index, released Tuesday. Greater Seattle had the biggest price hike of any metro area in the country. Nationally, home prices jumped 5.8 percent, a 32-month high, and yet local home values grew more than twice as fast as that. From Tacoma to Snohomish County, home values are up big across all price points. But the metro area’s priciest tier of homes — which includes the majority of Seattle and Eastside houses — rose at its fastest pace in more than 10 years. It’s been a similar story of declining affordability for quite some time. 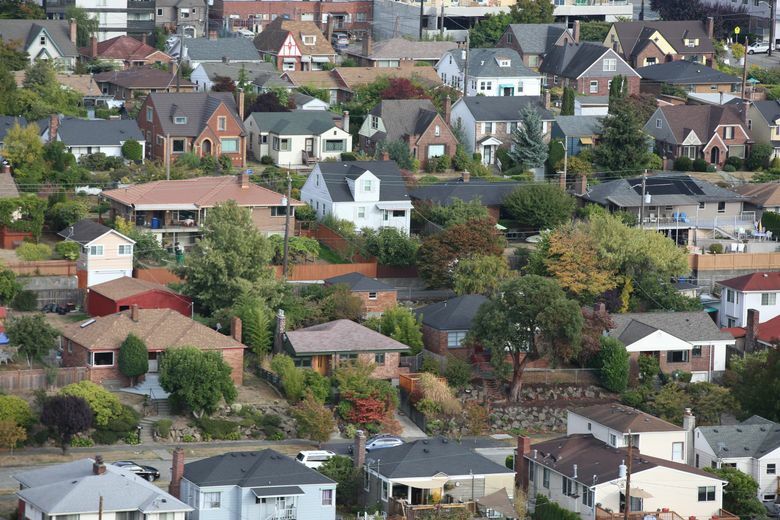 Overall, King County home prices have now doubled in the last half-decade. There are no signs local home prices are slowing — just the opposite. 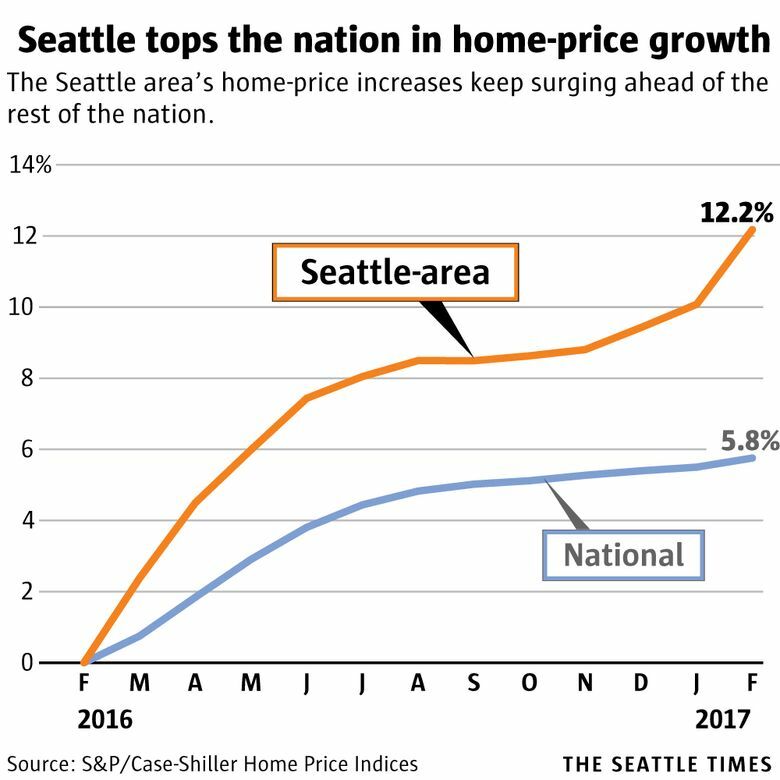 Compared to just a month before, Seattle area housing costs grew 1.9 percent, which was by far the biggest increase in the country, and about eight times the national average. The report looks similar to months past, with Portland again as the second-hottest market, though Dallas has overtaken Denver for the third spot. A separate study this week by local real-estate site Estately broke down home costs in a new way, comparing sales prices for homes based on which decade they were built. As you might expect, brand-new homes were the priciest, with single-family houses sprouting up this decade selling for an average of $845,000 in Seattle. But that doesn’t mean really old homes offer any great deals. Seattle houses built before 1910 now sell for an average of $725,000, while houses from the 1920s and 1930s command about $700,000. By comparison, homes built between 1940 and 1980 cost closer to $610,000, and those that went up in the ’80s and ’90s cost about $665,000 on average. The trend generally holds true even after controlling for the size of the home. And the results were similar for condo sales, with new and really old condos selling for the highest prices and middle-aged condos offering the cheapest deals. So why are timeworn homes so expensive? For starters, areas in Seattle with older houses often tend to be in more desirable neighborhoods with higher home values, like Queen Anne and Capitol Hill, while homes farther from downtown, in generally cheaper areas, were built later, said Estately CEO Galen Ward. Many of the oldest homes have probably been remodeled and modernized at some point, raising their value, while homes built in the second half of the century are more likely to be in their original condition, Ward said. And there are relatively few derelict houses rotting along city streets when there’s so much money to be made by replacing them with shiny new homes. Estately has only crunched the numbers for Seattle, so it’s unclear how the breakdown of home prices by age compares to local suburbs or other big U.S. cities. Seattle now sees an average of one home torn down per day, often to be replaced with a larger, much more expensive house. But in some cases, the torn-down homes are replaced with multiple, smaller new town homes that add to the city’s choked housing supply. Looking at price increases, there wasn’t much of a pattern for new versus old homes. Adjusting for home size, prices have grown the fastest in the last year for homes built in the 1910s and 1960s (up 15 to 17 percent), and the slowest for houses from the 1990s, 1930s and 1900s (up nearly 11 percent), according to Estately. And there weren’t any opportunities for savings for homebuyers across various price points, either. Looking across King, Pierce and Snohomish counties, prices for the cheapest homes in February were up 13 percent, compared with 12.4 percent growth for the most expensive homes and 11.4 percent for middle-tier houses, the Case-Shiller data shows. The growth in upper-tier prices (which includes average homes in pricey markets like Seattle and Bellevue) was the biggest since October 2006, while the increase for the cheapest tier homes (which exist mostly in Pierce and Snohomish counties) was the largest since May 2014.